World Championship 2008 was the last Yugioh GX game to be released and boy was it good. Upon openening the box for the first time, you was greeted by 3 super rare cards, these cards were Deep Diver, Burden of the Mighty and Dimensional Prison. My fondest memory of this game was earning credits online, the amount you earned depended on the level of your opponent. Some players would put their extremely high level character online with a horrifically bad deck, allowing noobs like me to earn tens of thousands of credits to buy packs with. The one and only Yugioh video game for the 3DS, in English anyway. World Duel Carnival thrusts players right into the world of Yugioh ZEXAL, introducing them to the new XYZ mechanics and ruleset. The problem is, it didn’t offer too much of an upgrade over previous game. It did have an up to date card list but that’s about it. The tag force series are my personal favorites, it may have been the fun & lively Yugioh GX world that seems so attractive. This was one of the first games where you could actually walk around and explore, rather than tapping on locations and having one person pop up. It wasn’t just awesome tag dueling, it was an adventure game. Man was this game a challenge, especially Solomon (Yugi’s Grandpa) and his damn Exodia deck. As you progressed through the game, you unlocked more cards but your foes upgraded even more. The more you beat another duelist, the better their deck becomes. You could unlock cool cards and secret duelists by defeating every other duelist a certain amount of times. There was so much progression, I believe I played for countless hours and still didn’t unlock every duelist. 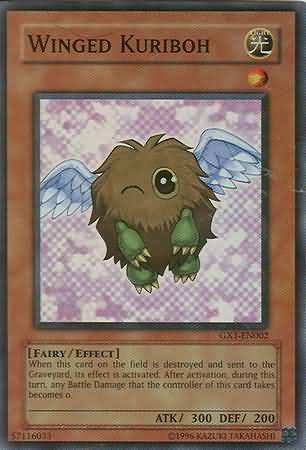 You have to love the winking Winged Kuriboh you got for free with this game. Yugioh GX Duel Academy was a relatively simple game, yet one of the best out there. It took you on the journey to become the King of Games, you progressed through a story quite like Jaden Yuki’s in the GX Series. Now for a completely different kind of game, one that had brand new rules and mechanics that have never been seen since. The main mechanic that most players enjoyed was the fusioning, you could choose any monsters in your hand to fuse into a new one. You didn’t summon the normal fusion monsters though, other cards (that are normal monsters) could be summoned by fusing the right cards. I was all over this game in my youth, the story was incredible even if I didn’t understand much. Seeing our beloved main characters in an alternate Egyptian reality was awesome! The most defining part of Yugioh GX Spirit Caller was the introduction of 3D monsters, the previous (and first) DS game, Nightmare Troubadour, had 2D monsters which was also an improvement. Spirit Caller also offered a much better exploration aspect, as you could go anywhere in Duel Academy and meet cool duel spirits along the way! I’m sure the majority of Yugioh players frowned at the likes of Yugioh BAM and Yugioh Duel Arena. These games flopped completely, they were obviously cash-grabs with new, poorly designed mechanics. Duel Links is a completely different story, it offers a more fun & fast-paced experience without the influx of new cards that have effects the size of novels. You get to duel all of the classic characters like Seto Kaiba and Joey Wheeler while unlocking more along the way. Overall it’s completely free yet fun & you don’t need to spend any money to progress through the story! Another free app that is currently available, Duel Generations is honestly one of the best Yugioh games to be released, arguably the best ever. You get to duel a large number of main characters from each series, unlocking cards and credits as you do. Those credits can be spent on packs which don’t have a lot of variety (there’s only 1 pack obtainable with in-game credits) but they do contain every card available. Even though the game gives you XYZ & synchro monsters, facing duelists from the first Yugioh series is still a challenge. I will first mention the practices Konami have taken regarding DLC, there’s way too much. However, for a game that cost $20, you can’t fault Legacy of the Duelist overall. It offers a PC dueling system that rivals anything ever seen, with incredible animations and 3D models for many monsters. Although there are a massive amount of DLC packs available, they aren’t required at all, you can do just fine with the base game. Some players have reported the game is too easy so that’s a possible downside but overall, it’s head and shoulders above every other Yugioh game. I was all over this game in my youth, the story was incredible even if I didn’t understand much.